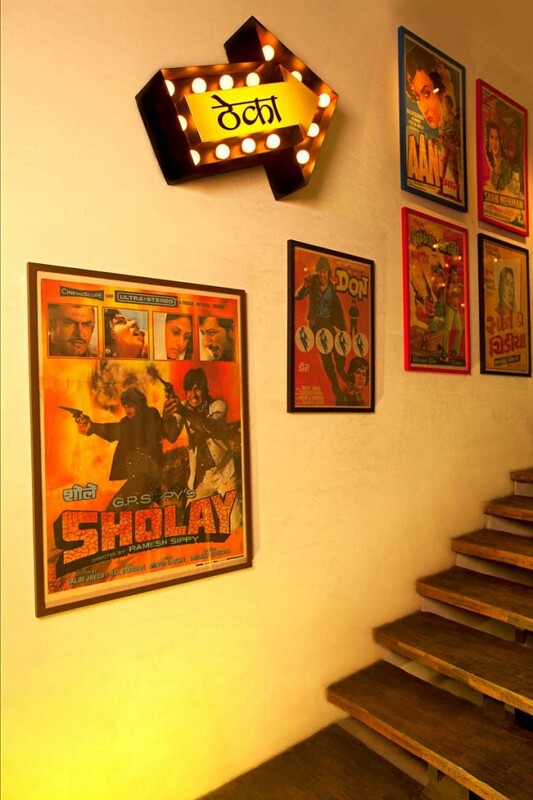 A fancy dhaba with authentic, mouth-watering cuisines and ambience more quirky than any present-day design boutique. With urbanization spreading faster than ever, each one of us has moved to newer and quicker ways to live, work and enjoy too. Those good old times are really hard to find. But there is someone who is determined to give the people of today a healthy stroke of authenticity with their desi-to-the-core dining expertise. We all have been to some great dhabas, that are now quite hard to find, but ever been to a dhaba in a mall? Yep, you heard it right. 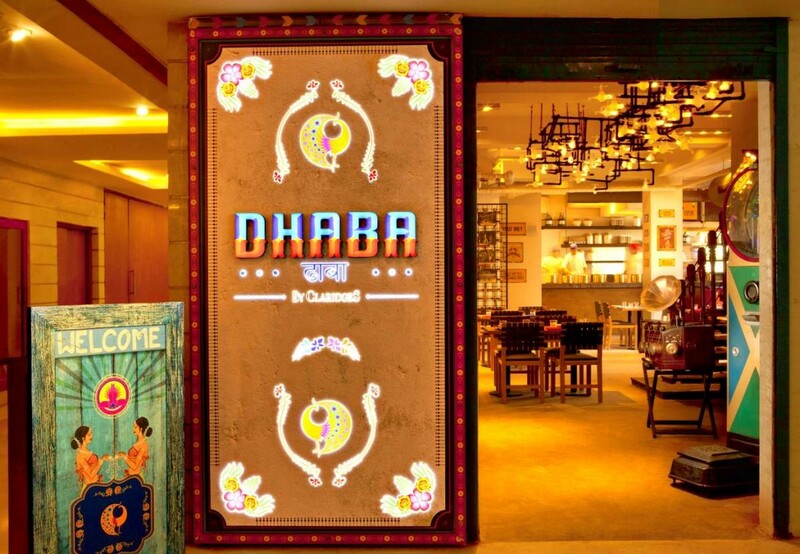 We are talking about Dhaba by Claridges situated at 2nd floor DLF Place, Saket, New Delhi. Now we were thinking that why would anyone open a dhaba in a mall, and how could it still be a dhaba when it’s already in a mall? But all we needed was to step inside to get the answer. The well-groomed manager gave us a very warm welcome, and fondness continued till the end of our visit. This place was a much livelier version of a highway dhaba. The ambience was intelligently designed to make you forget the mall bit of this place. 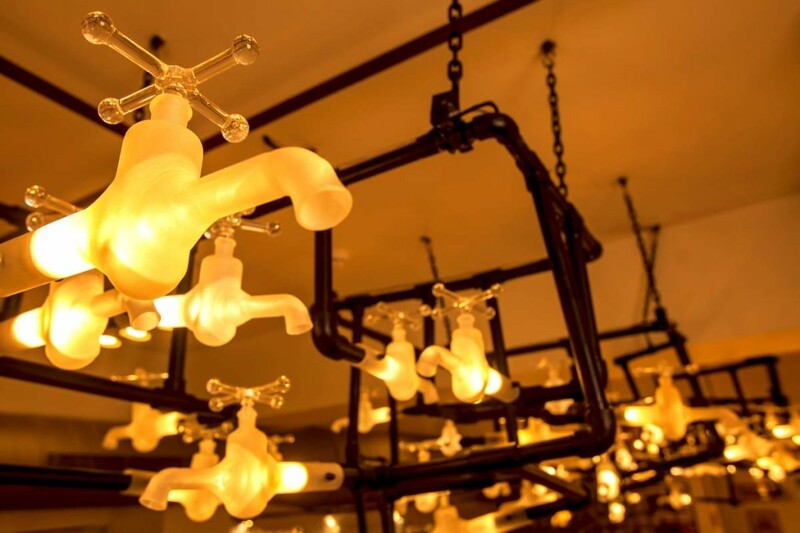 Everything from the peppy color scheme to the bright lighting, not to forget the tap chandeliers, were true to this place’s desi form. The tables were topped with beautifully painted traditional art, the chairs weaved like a charpayis, the kitchen bar decked with olden pickle jars and peetalutensils, and the music cheering a mix of old and latest Bollywood hits. 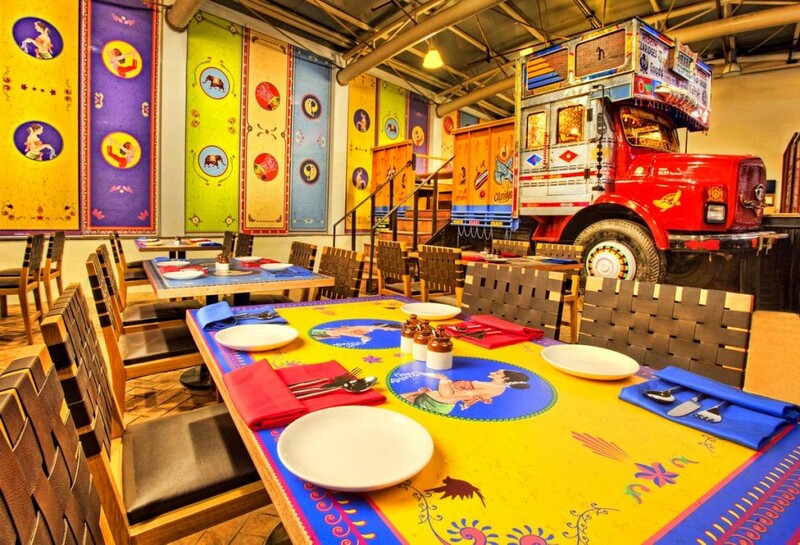 The wall décor deserved a grand applause for the ingenious use of truck tyres with quirky pictures, rear view mirrors, vibrant blinds, posters with quotes from behind the truck and the oversized hanging nimbu mirchi made in gorgeous crystal. There was also an actual truck with a proper seating space. I can talk about it for hours but just for your sake, I’ll get started with the food and drinks! We started with the cocktails at the Theka (yes, there’s nothing called a bar here). The first (and the best, we can say) was Somras which was Aam panna mixed with vodka. Now who could have come up with this? It was so refreshing, courtesy aam panna, yet strong enough to take you high! It was sweet and sour making it a complete chatkara and a must-try. Moving on we also tried Tar-Booze (water melon + lemon + vodka + black salt), Santari (fresh orange juice + vodka + chat masala), Gulabo (L.I.T. + kala khatta) and Pan Mohito which was like drinking the gulkand pan, super! And the desipana was not just in the names, these drinks were served in pauva bottles. Surprisingly innovative! Attention to detail was also given to the coasters that had artwork and messages you only see behind a truck. Their starters menu was also a delight. 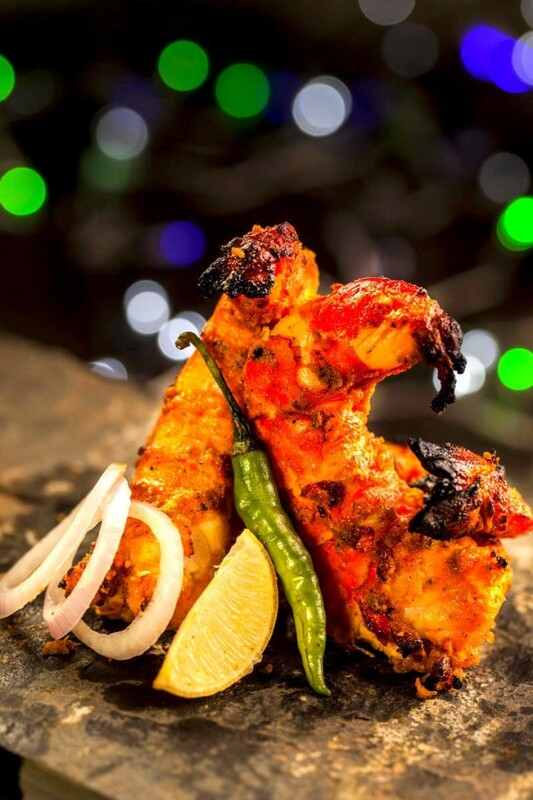 We began with Amritsari fish, the only fish cuisine in the house and they got it right! Served in a big portion, I was fresh, juicy and simply out of the world. Next in queue was one of their signature dishes, Amritsari Tawa mutton chap. Minced to perfection, it was well-cooked and tasted delicious. The Galoti kebab, served on a mini Lucknowi paratha, couldn’t get any better. It was soft like butter, as if digging your fork in crème. Not to miss these delicacies were accompanied by three cute pickle bottle miniatures including teekhi chutney, hari chutney and hari mirch ka achaar. The hari chutney was to-die-for! 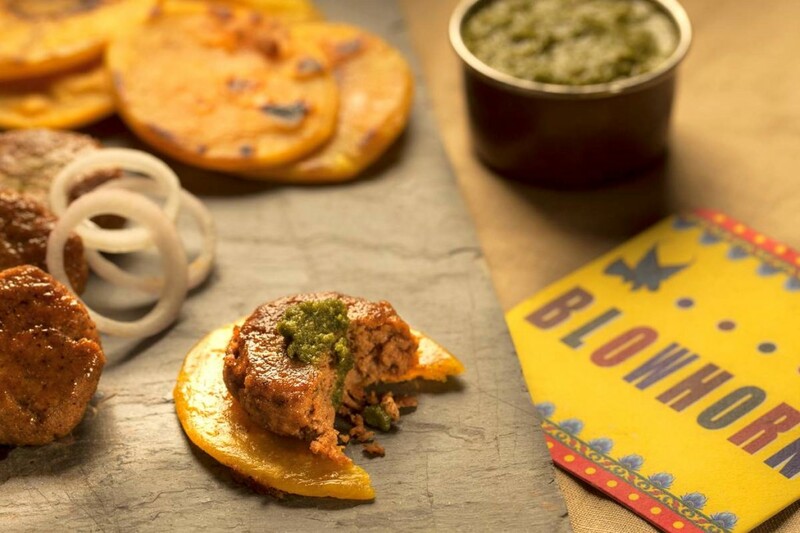 We then tried their other best-selling starter – Bhuna Aalu. It may sound regular to you, but trust me it’s not. Those crispy fried potatoes with sweet chutney topped with chopped tomatoes and onions have had me promise to myself to keep coming back here. The next veg delight was Makai Pyaaz ki Seekh. Shaped like good old-fashioned kebabs, the crispy coating surrenders to the softness inside as soon as you dig that knife. Their only prawn dish, Dhaba Prawns, were juicy jumbo prawns marinated for 4-5 hours in exotic spices with hung curd and yellow chilli. Like fish, this was also the best we’ve ever had. With so much stuffed in already, you think we would dare to go for the main course? Well, we did. 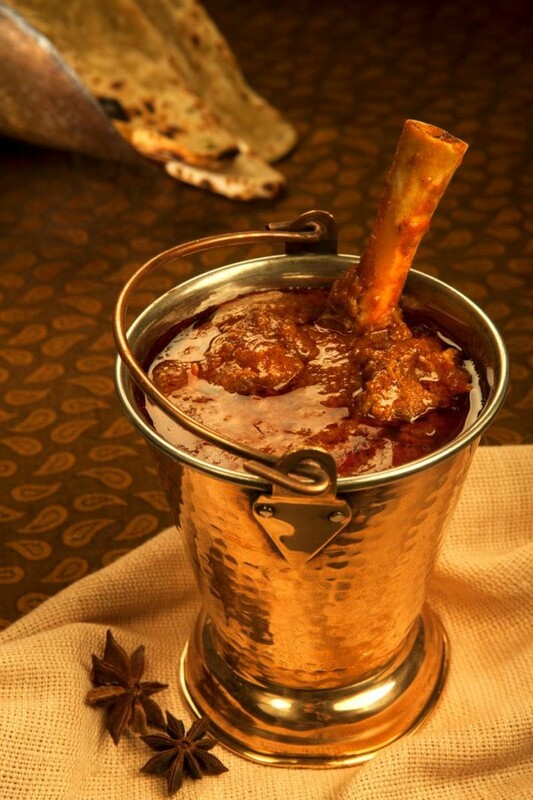 The Balti meat (their signature dish) was served in a peetal bucket miniature. It looked really spicy, but surprisingly it wasn’t. Even the Dal Dhaba which was dal makhani had a nice cremy taste to it. It’s rare to come across such a spice check in Indian food, and we’re glad that we did. An interesting dish, Tiffin Chicken was actually served in a two-tier tiffin with ajwain parathas. It was like opening a box of happiness! The shredded chicken was very soft and coated with mouth-watering spices. Even their Amritsari Alu vadi, and kadai paneer were remarkable. They surely pay great attention to presentation as everything served on our table was very well garnished with coriander. It’s a pity that we couldn’t try their pulao variety that seemed equally tempting. For our sweet tooth, we decided only for the famous sweet pan which is a heritage of Dhaba by Claridges. The pandit ji’s pan comes from the Chanakyapuri Claridges and has been there from past 40 years. While relishing its flavor we daringly checked out the weighing machine and guess what, we got a good fortune message. What a wonderful way to conclude the trip to the dhaba!